as the pitchfork bites in, then pulls. down the cobblestone path of the park. slashed with the sponsor's name. A day off from work to work harder. behind that skittering rat of a dog. that used to light like a lover's moon. and we stop at noon for free pizza. 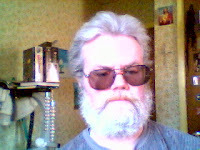 JBMulligan has had poems and stories in several hundred magazines over the past 40 years. He has had two chapbooks published: The Stations of the Cross and THIS WAY TO THE EGRESS, and two e-books, The City Of Now And Then, and A Book of Psalms (a loose translation from the Bible). He has appeared in several anthologies, among them, Inside/Out: A Gathering Of Poets; The Irreal Reader (Cafe Irreal); and multiple volumes of Reflections on a Blue Planet.